This mine has been opened during the past year (1888). It is a shaft opening. The coal vein is fourteen feet in thickness. The mine is equipped with all modern appliances. A compressor plant is in operation, running five of the Harrison coal mining machines, which work very successfully. In the future it is expected that this mine will figure among our largest producing mines. The company expects soon to sink another shaft, which will be used as a hoisting shaft, as well as complying with the law in using it as an air shaft, as it will be connected with their present hoisting shaft. This mine is owned by Mr. Simpson and sons. Determining which Lafayette coal mine, the Simpson or the Cannon, was first to begin production is a little confusing. Hand-written coal mining logs from the Colorado Division of Reclamation, Mining and Safety show the Simpson mine opening in 1889 and reporting 11,126 tons of coal mined. The hand-written records show the Cannon opening in 1888 and reporting 600 tons of coal mined in the same year. 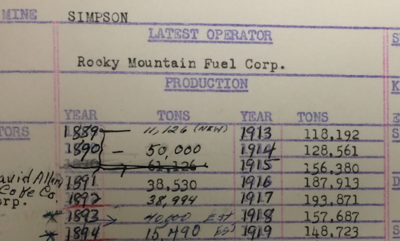 Mining logs from the Colorado Division of Reclamation, Mining and Safety, made in about 1920, show production dates for the Simpson mine corrected (overwritten) in ink. The state’s 1920s era hand-written mining logs for the Simpson reveal the equivalent of modern day Wite Out correcting fluid — the year “1888” is written over in ink with the year “1889”, a correction that appears to have been made many years after the coal production log was initiated. The 1887-1888 biennial report form the Colorado coal inspector points to the Simpson opening before the Cannon. The fact that the biennial coal inspector’s report shows that both mines opened in 1888, and that the Simpson produced 11,000 tons — versus the Cannon’s 600 tons — points to the Simpson opening before the Cannon. The Simpson mine, located in what is now the 700 block of East Cleveland, was sunk by Lafayette-area resident John H. Simpson (1843-1909) and his dad, James Simpson after they’d secured a 1887 coal lease from property owner James B. Foote, town founder Mary E. Miller’s brother. For a time, the mine operated separately as the Spencer mine and the Simpson mine, but the two were combined in 1893. John H. Simpson lived in Louisville until 1883, where he and his brother, William, ran a mercantile. John H. Simpson served as Louisville’s first mayor in 1882. The Cannon mine, located near what is now the intersection of East Emma and Merlin Drive, was sunk by James Cannon Jr. (1860-1906) and his dad, James Cannon Sr.
James Cannon Jr. founded United Coal Company in 1892 and, after that company was forced into receivership, founded the Northern Coal Company in 1895. 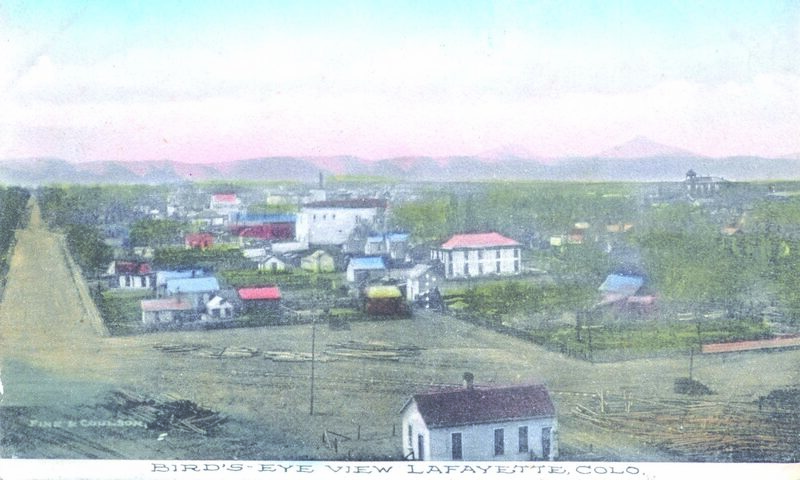 Several mines east of Lafayette, including the Standard and Baker mines, began operation as early as 1883.